Bright light with some sun is ideal. As with any new transplant, avoid direct hot sun for the first couple of weeks. 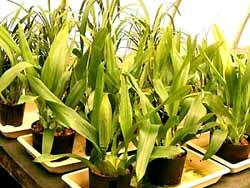 In most cases Oncidium orchids need very little time to adapt to hydroponics and start growing immediately. It's still a good idea to carefully manage your watering schedule the first couple of weeks. Healthy transplants will use up all their water in two weeks - maybe sooner. Others may take longer. on the other hand, if your new transplant doesn't use all its water in 2 weeks , dump out the water and see below. 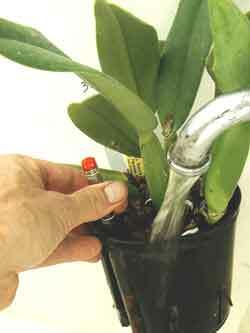 If your plant had healthy roots before repotting, it should adapt to hydroponics quickly. Oncidiums have rather thin roots that work hard to absorb moisture and send it up to the plant. 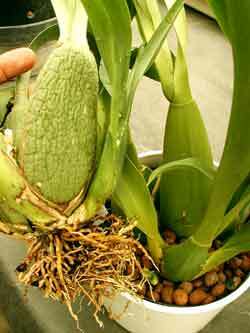 Oncidiums store water in pseudobulbs at the base of every new growth. Healthy plants have full, plump psuedobulbs. If your new transplant isn't using up its water in 2 weeks, its not happy. Also, if you found rotted and mushy roots when transplanting, your plant wasn't happy in its old pot either. The roots were suffocating as the potting materials decomposed. This potting mix did not drain well and the roots where too wet. Another sign of possible trouble is wrinkled pseudobulbs. In this case, the roots didn't supply the plant with the water it needed. Wilted psuedobulbs is a sign of dehydration. The plant on the right has healthy roots - notice difference? When you see a wilted plant your first instinct is to more water. If your plant isn't using all its water your first impulse is to give it a n extra shot of nutrients to help it get going. Stop! That's also the wrong response! Inactive roots can't absorb extra nutrients and unused nutrients turn to salt - which will cause more damage to the root system. If your new transplant isn't doing well, the problem is almost always in the root system. The proper response is - give the roots a boost! Lift plant (and inner pot) from outer pot and take it to the sink. Pour KLN Solution through pebbles. Repeat process 1-2 times a week. Water plant by pouring KLN Solution through the roots 1-2 times a week. No standing water at the base. This process gives the plant enough water to stay alive while promoting maximum air flow to the roots. The spaces between the LECA pebbles and the openings in the culture pot will promote good air circulation around the roots, stimulating new growth. 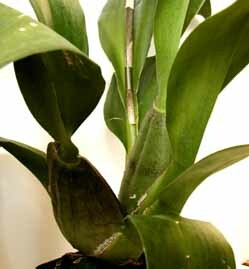 Older psuedobulbs may never fully recover and will probably have to be removed in a future transplant. For now, watch the new growth for plump, healthy pseudobulbs.